Most people aren't dedicated enough to their finances to create a massive and detailed budget plan that requires dozens of hours of work and months and months of modifications. So if you're excited about getting a budget together but don't want to put in the work, don't worry, there is a rather simple budget solution that you can use to meet your standards. For many, being honest with themselves reveals that this may be the only budget that they have the time and patience to create. The good news is that you can create a simple budget, also known as a "bucket budget", in just a few easy steps. Start your simple budget by creating three separate bank accounts. The first account should be a savings account. This can be a savings account at a bank or an investment account at a broker. The second two accounts should be checking accounts. The checking accounts will be used for spending and the savings account will be used for, well, saving. Now, it's time to proceed to the next step. Setup Your Wages to Go Directly Into Each of the Three Budget "Buckets"
Now it's time to match the three accounts with your monthly income. Contact your employer and have your wages deposited into each of the three accounts. If you are self employed or your employer still pays you with a check, you can do this manually each paycheck or set up your main bank account to make automatic transfers to your other two accounts. Here's how to use each account. Use this account to allocate how much money you need to save each month. Aim for at least ten percent of your income but if you can save more that's even better. The deposits to this account can be saved here until you have enough money to cover your emergency expenses (3 to 6 months of expenses) and then you can start investing the saved money after that. To make this work, you need to thoroughly analyze your simple budget and make sure that you are setting aside a reasonable amount. At all costs, try to protect the money you deposit into this account. Only withdraw money from here for emergencies. This account will someday be your retirement savings. The second account is a checking account that is used to make all of your fixed monthly and annual payments. You'll need to estimate how much money you need each paycheck to pay all of your living expenses such as mortgage, rent, car payments, utilities, cell phones and any other monthly expenses. Also, there should be some extra money built into this account to cover annual expenses like real estate taxes, insurance payments, and auto and home maintenance costs. When you first set the amount that gets deposited into this account there will likely be some errors. Most people underestimate their monthly costs because they don't realize how much they spend on such things as food and other costs. If you need to, modify the percent of your income that goes into this part of your budget as needed. Or, a better approach would be to try to lower your monthly costs in this category so that you don't run out of money to pay bills. This brings us to the third account. 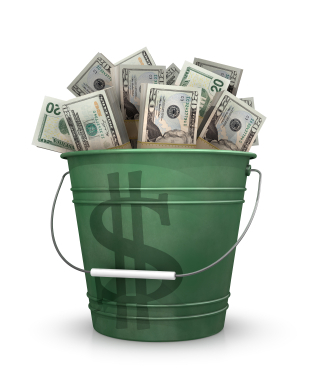 The third bucket account is a checking account where all of the remaining money is deposited. This money should be used each month to pay for such non-essential expenses as entertainment, dining out, electronics, clothing and other expenses that are non-essential. This account is basically the stop gap account whereby you can monitor it to see if you can continue to spend each month. For example, your deposits are made the first of each month and you only have a few hundred dollars left in this account on the last week of the month, then you will have to be very careful about how you spend your money. The best thing you can do is to try to bank extra money from this account each month so that it builds up this account so that you don't run out of money. You'll want to use this account to cover many unexpected expenses that of course seem to come up way more often than you plan. By using this account as a type of "allowance", you can more easily control your own spending so that you are able to stick to your simple budget. What an easy budget right? Let's cover an example of how one might set this type of simple budget up. Let's say you make $3,000 per month after taxes and that you'd like to be able to save ten percent of that each month. Also, let's say that your rent and other monthly expenses are around $2,000. To set up this budget you would open up your three accounts and set up automatic deposits of $300 to your savings account ($3,000 x 10%) and $2,000 to your bill paying checking account. That would leave you with $700 ($3,000 - $300 - $2,000) to deposit into your discretionary account. That means that you only have $700 per month to spend on discretionary items like entertainment, travel, vacation, hobbies, dining out, etc. It would be best to divide the $700 into a weekly figure and try to portion it over the month. In this case, it would be nice if you could budget for $150 per week of discretionary spending. That would total about $600 per month and would leave you with a small cushion that you could hopefully carry forward into the following months. It will encourage you to lower your spending and should help stop you from overspending or from building up credit card debt. It will take some discipline to stay on budget, but by saving a little extra in this account each month you won't have to say no to those great opportunities that may come up (like last minute ski trips or a weekend getaway that presents itself). By being practical and using this simple budget technique, you can truly make one of the easiest budgets available. And by sticking to it, you can keep the discipline that will allow you to start saving money each month in the hopes of building some serious long term wealth.